Many businesses will at some point find themselves in possession of special wastes that they are not accustomed to dealing with. This can happen when a product expires, when materials are left over after a project, when a business is preparing to move or when a tenant vacates a property and leaves waste behind. However they came about, it is important that these wastes be disposed of in a responsible manner to ensure that they don’t end up posing a threat to human health or the environment and costing you in fines and legal trouble. Any action where a was te is disposed of in a way that does not comply with the law is generally considered illegal dumping. 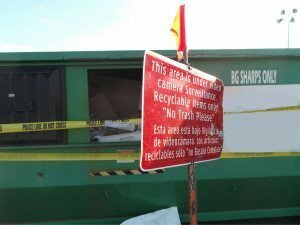 Even if a waste ultimately ends up in a landfill, if that landfill isn’t constructed and permitted to accept that particular waste it is still a crime. It may be tempting to place hazardous waste into receptacles meant for regular trash; especially if it is a small amount, but disposing of any amount of waste in an illegal manner could mean major fines. Some individuals may attempt to transport and dump waste in remote or concealed areas as a means of saving money or effort. Regardless of the type of waste, it it is placed in an area that is not intended for waste disposal it is considered an illegal dump. Many cities and small municipalities enforce penalties for violations but in some cases of dumping the Texas Commission on Environmental Quality (TCEQ) and Environmental Protection Agency (EPA) will get involved and purse criminal punishment against the offender. The increasing prevalence of security cameras and bystanders with smart phones also means that the people who engage in illegal dumping are more likely than ever to be caught. Paints, solvents, fertilizers, pesticides, used oils, tires, medical wastes and cleaning chemicals all require special consideration during disposal. Organizations that fail to budget and plan for waste disposal run the risk of going out of business but trying to handle waste while complying with the environmental laws can prove to be a challenge for managers who are already busy with their normal responsibilities. nly responds to chemical and bio-hazard incidents, we also work for our clients to manage their wastes in the most economical way possible. Our staff can arrange for transportation of wastes to legal disposal sites while providing documentation and removing the threat of your company being fined for illegal dumping. We specialize in handling and disposal of hazardous and special wastes so that your organization can focus on what it does best. You will find that Protect Environmental outperforms and costs much less than all other competitors working in the North Texas region. To learn more, feel free to contact our office by phone or email today. 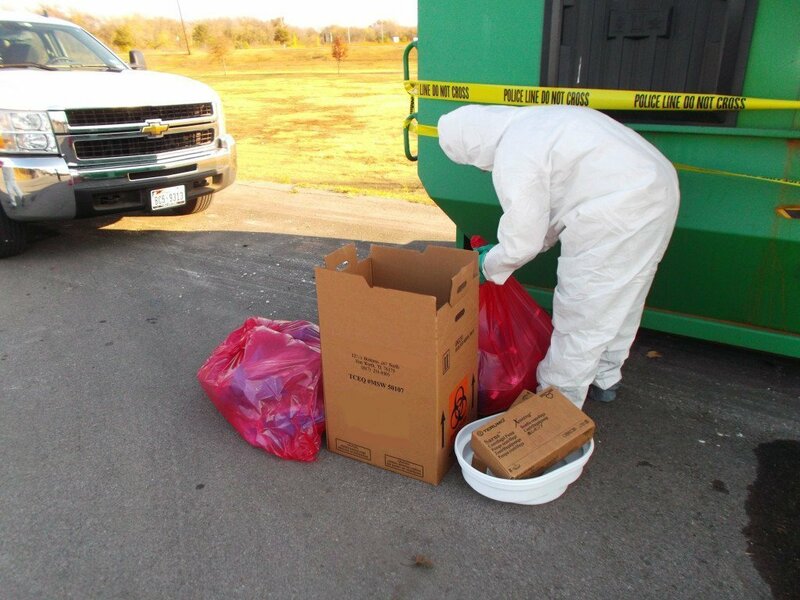 Protect team removing medical waste that was illegally dumped in a recycling container.